"Steps to the Beach and Sea"
Bedrooms: 2 "One is a Master Suite"
Garage: "coverd car port "
Best Villa/Condo in the Beach Front Development of Villas San Francisco. A Beautiful two bedroom and two bath condo located on the top floor of a two-story building with only 8 Condos total. You'll be just steps from the beach! Condo includes carport, Swimming pool and garden in the downstairs Patio. 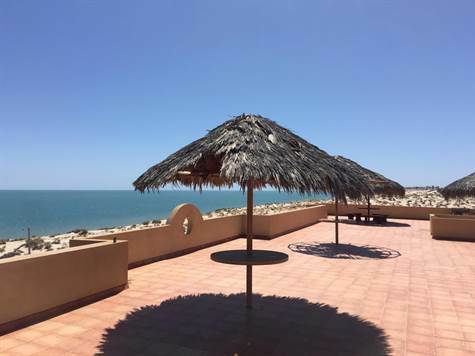 You'll have your own Palapa on the roof top to view the Sea, the stars and all the stunning views. The Master suit has ample closet space and patio slider door. Mimi split A/C units throughout and a patio off the living area for outdoor entertaining. All Stainless Steel appliances are included Refrigerator, Dishwasher, Stove and range, Microwave. Furnishings are not included but are negotiable. Top Corner location. Owner will carry. Excellent San Felipe location in gated and upscale community. Fideicomiso in Banorte.